What Equipment Do You Need for a Home Theatre System? 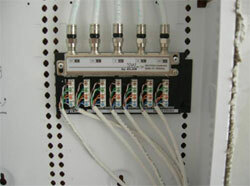 Audio video wiring is essential for the modern home with technology changing every year. Even with change, there are certain things you can count on for the foreseeable future. TV receivers will most likely use a coaxial cable from the satellite company or cable company, speakers will need wires to connect them and telephones for many people still have a wire attached. Yes, there are exceptions, wireless speakers, Wireless HDMI (HDTV Cable), VoIP Telephones and the like are already in use, but for the vast majority of people, the standard technology of the last 30 years still applies. You should plan your home's AV infrastructure accordingly, with plenty of TV, Phone, Network and other wires already in place in as many rooms as possible. A central wiring cabinet, like the one in our garage will make upgrading, installing items or re-wiring a cinch and should be a “must have”. If you are planning a home theater system, or a theater room like we are, having 5.1 or even 7.1 channel audio wiring in place will save a lot of effort down the road. Our home theater is pre-wired for 5.1, two front speakers, a center speaker, two rear speakers and a subwoofer. We also opted to run an HDMI cable as well as power outlet in the rear ceiling of the theater room to accommodate a digital projector. In home speaker systems are also popular. As an added measure, we have pre-wired two speaker jacks in the ceiling of the living room / kitchen area with an independent volume knob for indoor music. We also had two pre-wired speaker terminals placed on the outside of our house at the patio with their own volume control for outdoor music. All of these wires lead back to the media room so we can hide the audio components away. For your entertainment room of your dreams, you can set up a home theatre system, similar to the ones featured in shows about celebrity homes like MTV Cribs. If you become familiar with the equipment needed for one, you are ready to go. So what equipment do you need for a home theatre system? You can choose to buy equipment separately or get a home theatre package. To make your home theatre system more customizable and better in terms of sound and sight, buy your equipment separately to get the best cinema-like TV viewing or movie watching experience with your home theatre system. The first piece of equipment you should purchase is a high-definition television that can please you visually with its high-resolution and surround-sound features. Some televisions these days now have 3D, though only a select number of DVDs are viewable in 3D on TV sets. Therefore, it would be fine if you just stick to a TV without that feature, unless you want to be as forward thinking as possible and you have money to spare for a TV with a 3D feature. For a better surround-sound feel, get your home theatre system a home theatre receiver. It controls your audio system and amplifies the sound from your television. You can also use it as a connection to different video sources like your PlayStation, cable box and DVD player. Through your receiver, you can easily switch from one video source to another. For example, by just switching a button, you can play your favorite video game right after finishing a movie. The surround-sound feel of a movie theatre can be fully replicated if you get enough speakers and a subwoofer to add multiple surround-sound channels for your home theatre system. You can buy a set or buy speakers individually. Your best bet is to purchase from the same brand so the sound coming from each speaker will be consistent with the others. Of course, your home theatre system will not work without the necessary speaker, audio and video cables. Each of your equipment may already have its own set of cables, but if they are short in distance, you will need to purchase new and longer ones. Make sure you get the best cables so the video and audio performance of your devices will be of high quality. Make sure to get a power protection unit so that problems caused by power surges and bad weather conditions (lightning strikes) will not affect your home theatre system. To save energy, get a power strip so you can plug in all of your devices together. Get yourself a universal remote so you will not have the hassle of looking for the remote control devices of your various equipments. This way all functions of your home theatre system can be switched on and off by just one device. Some universal remotes even incorporate light switching. Ask around for what controls can be incorporated in your universal remote and what other devices you can use as a remote control. There are brands for which you can use a phone as a remote. For example, you can use an iPhone as a remote for an Apple TV. You need to have furniture and stands where your audio-visual and other equipment will be placed. Make sure the furniture that you purchase can handle the weight of your equipment. Do not skimp when it comes to your home theatre system furniture because if you do, your equipment will be at the risk of damage from falling. If you want to get creative, spruce your room up a bit. Carpet your entertainment room in black. Paint the walls dark. Add a popcorn machine. You can also get your old car seats and have them installed in your entertainment room. If money is not an issue, many furniture stores sell entertainment loungers for this type of room. You can buy one or you can buy many and connect them together for the theatre look. It would be beneficial to visit your local electronics store. Sometimes, they have home theatre systems set up in separate rooms that will help you determine what equipment you will need and what you can buy based on the space you have to work with. No matter what decision you make, a home theatre system is an investment that the whole family can enjoy for many years to come.